Today two big bits of news came out about Foursquare - in the US they'd done a deal with Zagat, Warner Brothers, HBO and others, in the UK they'd done a deal with Debenhams and Dominos Pizza. Very good news for them, and really encouraging that mainstream companies are using their service considering how new they are. So what's going to happen with Foursquare? Over the past week I've had 2 or 3 friend requests a day, which suggests that it's gaining a lot of traction. I use various other services, like Qype, and Urbanspoon, and I definitely don't remember any of them having a similar level of buzz or takeup among my friends. 1 - I can't use it to find things very easily. There's no way to find popular restaurants near my office. Admittedly if I search on Holborn (the area of London where I work) there are two recommendations at the bottom, but this isn't great. 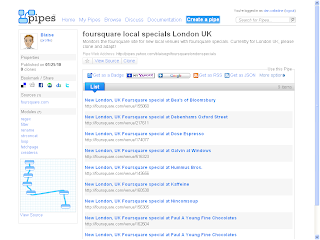 Compare it to Urbanspoon - I get top restaurants, maps etc. 2 - It's too easy to fake. I can check into places virtually online, using mobile check in. 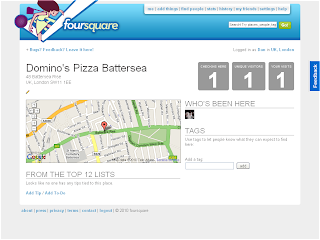 In fact, I just set up and checked into Dominos Pizza in Battersea, somewhere I've never been to. If I check in again I'll become the Mayor, and I'm entitled to a free pizza, according to their deal announced today. (Not that I'm going to, but someone might). (As with pub quizzes, don't make the prize too big - it only encourages people to cheat). But... Small niggles aside, it's going to be so useful. At the moment they're collecting lots of data, and I hope that start to use this productively soon. There are some mashups out there, like this one giving you the venues in London with special offers for Mayors. I'm not trying to be snarky; they have an amazing opportunity, and they have genuine buzz at the moment. Make it even better!